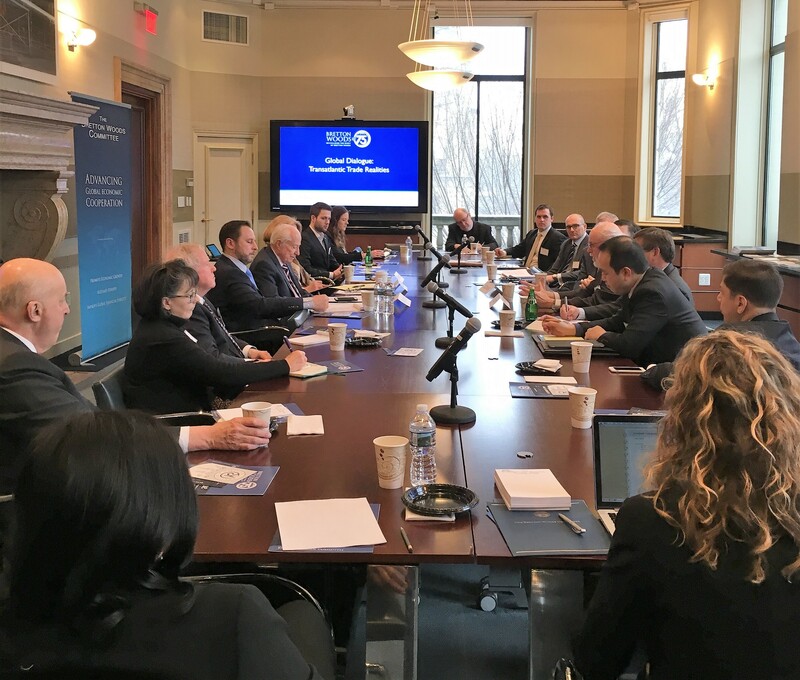 On February 1, 2019 the Bretton Woods Committee in partnership with the German Marshall Fund (GMF) of the United States hosted a Bretton Woods@75 Dialogue on Transatlantic Trade Realities. The dialogue examined future global trade prospects and realities, focusing on the state of trade on both sides of the Atlantic and implications for the future of multilateral trade relationships and the global trading system. Karen Donfried, President at the German Marshall Fund, Gary Litman, Vice President for Global Initiatives at the U.S. Chamber of Commerce and Jeffrey Schott, Senior Fellow at the Peterson Institute for International Economics helped kick-start the event with opening remarks. Jim Kolbe, Bretton Woods Committee Co-Chair and GMF Senior Fellow, moderated the dialogue. Transatlantic trade reality: Participants discussed the path forward to improve the transatlantic trading relationship, which some believed was at its lowest point in many years due to threats of steel and aluminum tariffs, disagreement on rules for agricultural products, and differences over World Trade Organization (WTO) reform. The degradation of the transatlantic relationship is exemplified by the fact that the European Union’s two recent WTO reform proposals were signed by China, but not the United States. The group noted that Europe and the United States should aim to return to the same side of the negotiating table on multilateral trade. Implications of U.S. trade agenda: Participants discussed the implications of the U.S. trade agenda on global trade relations and implications for the future of the multilateral system. U.S. retrenchment from the multilateral trade model, particularly withdrawal from TPP and disenchantment with the WTO, has benefited Europe and presents an opportunity for Europe to take on a larger leadership role in the global trade landscape. Participants also highlighted U.S.-China trade escalation as a major destabilizing factor in the current global trading environment but were hopeful that ongoing negotiations would lead to greater stability and long-term reform in China. Role of trade – transactional vs. relational: The group identified the role of trade in domestic politics as a central tension in the global trading system, debating whether trade rules and agreements should be narrowly circumscribed as vehicles for commerce or more broadly used to achieve larger foreign policy objectives. The undercurrents of these competing views had clear connections to populist movements and the fear that the benefits of trade had been overpromised to domestic populations. Thus, the extent to which social standards should be attached to trade agreements and the usefulness of national trade-adjustment policies were also key topics of this discussion. Balancing these two perspectives on the role of trade will likely be an ongoing feature of future global and domestic trade policy. This event was part of the Bretton Woods@75 series of dialogues to gather forward-looking perspectives on issues impacting the Bretton Woods architecture, institutions, and Committee. Bretton Woods@75 is a global dialogue to honor 75 years of economic progress and to revitalize the spirit of Bretton Woods now and for the future.